Have an item to exchange? 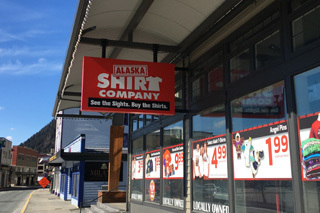 We really love our customers - we wouldn't 'exchange' you for anything and we sure hope you'll 'return' someday ;) We also trust you'll be happy with your time in our store and whatever items you take home from Alaska Shirt Company. We invest a lot of resources into creating a shopping experience and offering products that we truly think you'll enjoy while you're here. While we believe in our products and will exchange items for you once you arrive home, please understand that because of the remote nature of Alaska, our postage rates are very high. Therefore we will need to add postage costs to any requested exchanges. Thanks for understanding. We really love you, our customer. We trust you'll enjoy the time you spend in our store and the items you take home with you. We invest a lot of time and energy into creating a shopping experience that will add to your time in Alaska. We also take pride in offering products that will keep that "Alaskinspired" smile on your face. In the rare event that an exchange or return is necessary, it's not a problem. However, because of the remote nature of Alaska, our postage rates are very high and postage costs will be added to any requested exchange.